Get everybody on the same page, when they're not in the same room, instantly. Review documents and designs. Train staff. Demo products or just show off. join.me is a ridiculously simple screen sharing tool for meetings on the fly. "Great online meeting platform for slides/deck and screen sharing as well as video conferences"
Besides a source for online webinar style presentations, the tool enables robust screensharing which can be used for walking clients through websites/UIs in a how-to manner. Perfect for training new employees that are remote or showing clients software demos, etc. The application on tablets is amazing also! Prefer not to use the software version on desktop, but the mobile/tablet experience app makes up for it. User the web version on desktop instead. Use the web version unless your company doesn't have firewall restrictions or admin access requirements to install the software. Solves for the need for a demo platform, presentations, and chat within webinars. Affordable so that even small businesses can utilize. I love this software, working in customer service is hard to troubleshoot issues when you're not there so this app helps me be able to take control of the customers computer and troubleshoot the issue with ease. I am able to share my screen and show the customer certain things as well as join others onto the conference. Nothing, maybe the interface could be changed provide easier access to certain features. I don't like having to pay for the program when it started out free. There are other software and apps that do not charge and have the same features. If anyone is looking for a program to share screens and control screens this is the software. It allows you to share screens and control each others mouse. I am able to take control of the customers computer and fix their issues as well as provide my screen and show them helpful tips. Screen sharing, mouse control are some of the features I like. I also like having the audio to better assist with that way I can help the customer and explain what I'm doing in the process. The ease of file sharing through the software is also a benefit. If I needed to send a file to the persons computer I can quickly access it through the software. The use of a webcam and video conferencing makes this even better as it allows personal one on one help. "Very easy to use and has an intuitive interface"
Joinme is a videoconferencing software that becomes a great tool for professional use, is very easy to use and has an intuitive interface, allows you to share documents and messages instantly, share screen and show only the part of the screen I want to show, has a price quite low to what you get in the market. Sometimes in meetings with many users the sound fails even though I listen well to everyone else, among them are not heard. I recommend to try the app for android because it is the best, it works even with low intensity internet bandwidth. It is a software that really facilitates everything in my work because it allows me to get in direct contact with my client and be able to talk face-to-face about their finances and advise on their investments in digital currencies, it is also ideal for transmitting a webinar and capture customers, I can share balances, statistics and graphs that support my analysis. 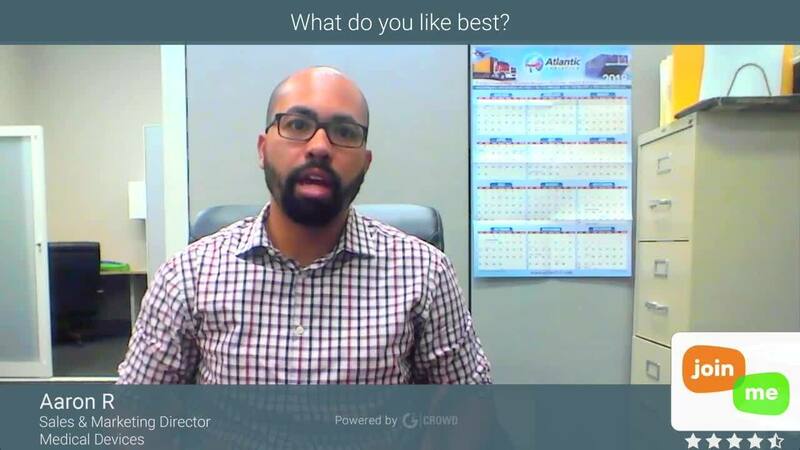 "It allows me to share screen and show a slideshow"
I like JoinME because it allows me to share screen and show a slideshow, I like it to be compatible with my tablet and my phone for when I'm not at my desk, it allows me to record videoconferences and meetings and stores them securely in the cloud. Sometimes there are sound problems and for the other person to share the screen must download and install the app. It is a basic communication software, considerably improves the interaction within the company but is somewhat limited, if you need something simple without many features is what you're looking for. Excellent videoconferencing and chat tool that allows me to improve my performance when I have to interview many people, when we are in full recruitment for large companies I do not have enough time to interview each applicant, thanks to JoinMe I can interview them by videoconference and even make support groups and training once candidates enter the company. "The simplicity of this software really makes the difference of other software." With this software I consider that I have been able to develop the best videoconferences, it is not necessary to have the greatest knowledge in applications of this type, join.me really that makes it simple, its interface is very practical, it allows me to create enlances to be able to share my screen with the rest of the working group, it does not consume much with respect to resources, it is compatible in mobile, like iOS and android, allowing to carry out many meetings from where each member of the working group is, its quality of video call and audio they are spectacular. Actually it has been a quite complete software I do not have any negative point of this software, just a suggestion that it would be good if the end user does not ask for an account to register. Join.me is excellent because you will not regret to join this spectacular software, it is very easy to install do it! The purpose of use of Join.me within the company was to hold more frequent meetings, since sometimes the distance was an obstacle, and that already happened to be part of the history, now we keep the requests of the clients in a way more remote, and not only that, now the team has more knowledge about this application, its management is simpler, and we have advanced on a large scale with the theme of collaboration for the company. An important videoconferencing program, is very affordable for any company and provides cutting-edge communication, excellent image and sound quality, customizable backgrounds or samples offered by Join.me, its interface is friendly and eye-catching with strong colors (Green and Orange), the control panel allows me to easily see my meetings, access my configuration, share screen, record meeting, has a variety of audio configurations and meetings available. It is an excellent software for beginners but lacks many advanced features that if they offer other video conferencing software. I like Joinme because it's easy to use for anyone and keeps me connected without having to abandon my desktop tasks. I use Joinme to meet with my work team, my boss and some supervisors from different departments, and it helps me a lot because I can share documents and images during meetings, it helps a lot when I have to interact with special licenses that do not have much time. "Neat little screen sharing tool with some quirks"
It's very simple to use, interface is not too cluttered. Also the ease of use on multiple platforms, particularly mobile platforms is a huge value addition. If you share the connection on multiple computers, it is sometimes quirky. I have had issues in the past when there has a significant time lag between my screen and the remote screen where it is being viewed. I have had some issues with the voice calls using the computers microphone and speakers. The audio calls using a phone connection appear to work better. if you want a cheap solution with not many features, go for this. This tool does not have transcribing capabilities so if that is important to you, this may not be ideal. Also, you cannot conduct polls and other interactions with your participants. If you intent to share the same login on multiple computers this will be a good tool. The also offer free versions for people willing to try it out. You may also want to compare this service with other platforms such gotomeeting, adobeconnect, skype for business, cisco webex etc. if you are planning on using it for enterprise purposes. Also, consider the number of potential attendees for your webconference or webinar. Join me is more suitable for small businesses. If cost is your main consideration, then definitely try this out, especially the free version before signing up. Screen sharing is the biggest help. "Below I describe join.me as an excellent work tool." I like that it is easy to use and more for those users who are beginning to use this software, I love the audio when a videoconference is taking place, its auidio is very clear, regardless of the number of participants, it has many tools that business level save many resources both human and material resources, it is so easy that you do not need to write to the support, I loved the way to share screen with the mouse, allowing everyone to show our presentations as if they were slides. Something as such that I dislike is that usually slow down or delay the way to process functions on my PC, I would like very much that it was not necessary to download the application so that several users can share screens, but just by placing the link is complete . Do not hesitate to acquire this great product, which with the passing of the days advances contemporaneously with the market, look at the investment for improvements within your company and you will see how your employees advance in the use of videoconferences. What we wanted to acquire this software is that our employees at the time of presenting an emergency, could develop their workloads, either from their homes, or wherever they are, we use it only on special occasions, and when our customers need immediate attention, so give you good results, so just connect only once, this software also helped us that employees who are in other countries, can provide their monthly progress through this excellent software. "Join.Me allows us to conference with internal teams and external partners easily"
Whereas with other video conferencing solutions, Join.Me is easy enough to use that even someone not savvy with computers can use it. We've had many external clients compliment it's ease of use. It provides conference lines and screen sharing links in the invites so it's easy for anyone to get connected. For video conferencing the program works very well but it's lacking in remote desktop features which it was advertised to us as. It doesn't work as well as TeamViewer which we were looking to replace with this but ultimately we found the features weren't as beneficial or even at par with TeamViewer. So I would taper expectations for this as a remote desktop tool. We're able to efficiently communicate with internal and external contacts in a way that's efficient and productive for all parties. This allows us to resolve issues, answer questions, and collaborate on projects much easier. "Good meeting application with basic tools"
This tool is really user friendly, Does not consume many resources and for new users does not require complicated steps for eiher join or be the host of a meeting as this is a web based application which does not require admin rights for any user to start using it. The graphical interface, the colour palet is very unlikable, also the meeting connection was not stable which caused the users that tried to take control to experience an slow connection. For other meeting applications I recommend to have a web cased version that allow you to take control of the machine when necessary as there are application that allow you to do this only when you are running the application but not the web based version of it. When a remote user is unable to bring the laptop to the company for any reason we use this tool to manage the computer remotely and this allows our team to avoid any critical emergency in case we need to access a laptop when this is not on the company. This Join.me application is a platform that has a large set of communication and work tools within its system, which seeks to facilitate companies and their respective users to develop the activities and tasks of the organization through chat rooms, in which the user can join an existing meeting or create or organize a new meeting. It allows to develop audio calls, video calls and videoconferences. Also in the videoconferences Join.me allows one of the participants to share and show the rest of the users both a window of their system and a presentation in slides or the whole screen at the same time, which is innovative and truly useful. It is compatible with the IOS, Android and PC operating systems. It allows recording conferences, has unlimited audio, has a free version. It has a link that takes you to a set of manuals explaining in detail the use of the tools of the application. Up to 250 users can participate in conferences. It is a very complete application. What I do not like about this application is that when saving the recordings and other files, it does so immediately in the cloud, without allowing me as the user to choose the destination. In the Basic version the aplicaicón does not give you space in the cloud, in the pro it only gives you 5GB, and in the enterprises version it has 100GB of space, although it is quite enough it could be insufficient. If you need an application that improves the quality of internal communications, including sharing the screen with other users, this application will be very useful for you. With Join.me we have improved the quality and performance of video calls and video conferencing thanks to its innovative function of sharing the full video screen. It has also allowed us to improve our efficiency because it allows us to use the shared screen and the video call while doing other simultaneous activities. It allows us to perform support functions for other colleagues without leaving the desk through the shared screen, observing what our partner is developing and helping them in a better way. It's so easy to use. Every time I had to log on to Join.me remotely or in the office, I was delighted by how user friendly the tool was. I do not even know how their customer service is because it's so easy to use. Never had an issue. After using this tool for 3 years, the only thing that I don't like is that you have to download the app for Join.me and have that open during a meeting if you are presenting. I wish it was completely web-based. If you are an organization that is considering an online video conferencing system that will be cost effective and easy to use, this is system for you. I can't say enough about this great tool. It makes working remotely and collaborating with other satisfying and streamlined. The only word of caution is that you have to download the app to run the meeting, so you may have to relax the firewall so the app can be installed. It' so user friendly that if we have to invite a client to join the meeting unexpectedly, it's easy to understand and teach someone how to effectively use the tool.
" The best in video conferencing"
The most pleasant thing for me is the function of the screen to share the screen together with the mouse control, not limited to just one of us. Both parties in the chat can use it. This made my job much easier when I trained and my new employees for guidance and training on the programs we use or reviewed documents. It lacks some of the Go to the meeting tolls (recording options, etc.) but for the price it can not be beat. It is an excellent tool it is quite quick and easy to share the screen so that everyone in the meeting looks at the same. It makes the meetings more efficient and allows you to complete what you need to complete in the necessary time, plus you have a free trial I recommend it with your eyes closed. In our company, this tool is very useful both to do and train with people who are in other locations and at the same time help our customers with the technical service of our products, it has really been very useful, has a very friendly interface and It has the easiest work for everyone. "Join Me for a great program"
This program is one of the simplest online conference meeting programs out there. The most tech savy will love it and the 'older generations' can use it with ease. I don't know anyone who would have issues with this program. My only issue with the Join.me software is the screen sharing feature. At times the jumpiness, lag and overall connection issues can cause this feature to seem like more of a pain than its worth, The software tries its best to force the connection to keep going when really it should wait for the connection to stabilize. I would recommend that people really check their options before using this program. There are quite a few programs that are on the market. The free version of this product does make it tempting for people on a small budget though. General business conferences with possible future employers, people I consult with on particular hard tasks that I have and hardware suppliers in Asia. "Easy to access on most computers and web browsers"
I really like the ability to connect quickly and easily. The call quality for both audio and video is generally very good and clear. Getting your call participants to connect to your call is a relatively straightforward process. They don't have to sign up for an account or go through a lengthy process to connect. It's also great that we don't have to download and install any software. We can just connect through a standard web browser. I haven't experience many negative issues, but I feel that using join.me opens you up to the possibility of there being unauthorized access to your computer. Even though there are measures that join.me takes to ensure the connections are authorized, the underlying structure of the website may leave your computer more vulnerable compared to not connecting to it at all. I think most businesses can use join.me for online meets and to enhance remote collaborations. It's an ideal solution for those that want to simply the online conferencing process. I'd strongly recommend it for both small businesses and large corporations. I can host and join meetings with people remotely, which helps for collaboration and staying on top of business matters with colleagues and clients. join.me allows me to connect to just about anyone, regardless of there technical ability or the computer they're using. We're also able to share screens, which has greatly helped for remote analysis and discussions about documents and other project files. Great video calling software that offers an intuitive interface and the ability to make video meetings, with a simple code you can igresar to a meeting, my customers who do not know do not take long to learn to use it, very good. I have not found errors in this software, I sire me for what I need are simple online meetings and some videoconferences. I recommend it because it offers high definition video calling and is easier to use than other similar programs. Joinme is the software that I use most to communicate with my customers, is very good because I can give videoconferences to attract new customers, I can also make meetings with my current customers to explain the progress of the portfolios I manage, I can show parts of the screen with graphics to better explain the points to consult. The easiest way to start is what I like most about join.me. As an IT staff member, I use join.me almost daily to connect to workstations remotely. Once you have downloaded the application, you can easily join my meeting and take over your computer. You can record the saved meeting so that a participant who could not participate in the meeting can see it. The fee for the paid version is calculated per user (it can be expensive quickly). I also encountered several desktop applications problems. It's also annoying when the application forces the end user to register an account. If you help people, their time increases. I would love it if there was also a way to run it always in one place (like TeamViewer). It is a great product which works and requires very little knowledge of the computer. It's also great if you have to look at a problem or a presentation more than one time. It is a perfect tool for small businesses with a low budget. So if you wanna try it, I'd say try it. We use join.me to support our clients remotely, especially when you only have to connect once. The user- friendly interface was easy to navigate for all team members. I remotely support multiple people. Join.me simplified this process. We prefer to use join.me, where we can share screens insted of sending emails or making phone calls. "The simplest, lightest and easiest to use software to share the screen"
"From the experience I've had with Join.Me, it's been great! " I like that join.me loads and opens quickly and seems to have minimum errors or glitches during web conferences or presentations. I also like that it integrates with my calendar so that I can schedule a join.me meeting directly through there. Depending on the area code of the phone line people dial into, they will ask if that is where I am located. It's not a huge deal, but it'd be nice to have a line in the Indianapolis area so that I can use that as my default line. Other than that, I don't have to use it frequently enough for my role to have experienced any other problems. We use join.me for some web conferences. As a global organization, it's easier to hop on a join.me where we can share screens and present information rather than try to email back and forth or have a basic phone conversation. "Great Free Screen Sharing Software"
I like that you can use the free version and get started super easily and effortlessly begin to share your screen with others. It makes sales presentations way more effective and allows me to control what my customer is seeing 100% and keep the presentation under my control and timing. There is not a lot I don't like about it. It can be slow from time to time and it was difficult to figure out how to switch which screen is being shared when using more than one monitor. It would be cool if there was a feature where you could share more then one screen at a time if both users have more then one screen. . Can be very slow and cause computer to lag and dysfunction when having many things open at once and especially when using an old computer. I was using an older PC for some time and when I had many Chrom tabs at once and used the screen share I would have long times for joining and experiencing lagging and my end and the consumers. Also had black screens put up form time to time. Use it - it works and its easy, which is the name of the game! Helps me show my digital product/service to potential clients. Allows me to walk through account setups and review ad pages with others to discuss solutions for them. Join me is a fast and very simple program to work with if you need to get something done and of course to work with others. Join me provides a simple click download as well as a security code for your protection. Multiple members can join in and it's simple to use. Security could be better as sometimes I have a hard time deciding on if I am actually safe using the program. A lot of people get hacked using programs like this. Not only is the security kinda iffy but, there is also a problem with scammers using this program to exploit older folks and random people out of their hard earned money. I'd say this is a really good program but, they'd have to fix the scammer issue that is currently happening. I would have to say if you'd like to try join me to do so as it can be quite an easy experience. Really simple to setup but, the support isn't always the best but, if you can get past that it's pretty damn good in very many different ways. So, if you'd like to try it I'd say defiantly give it a try. I feel like you'd like it. We can have really as many people as we want inside the call without any worries of course quality can drop with more people but, it's nothing really big. Chat is quick and we don't have very many issues responding to each other. We can quickly setup things how we like them. "Want to annoy prospects and lose deals? JM is the platform for your sales team!" Not uncommon for the screen-share to be several minutes delayed on the prospect's side. Despite sharing your entire screen, sub windows/pop-ups do not appear for the prospect. When entering the Conference ID, you frequently have to retype the code despite inputting it correctly the first, second, and third time! Our sales team struggled with these issues for months, the last 2.5 weeks it's been atrocious and impossible to use for the reps. Our sales cycle is delayed and we're actually losing deals because prospects don't have the patience to deal with JM's BS. Support has been completely unhelpful. Do not sign up with JM or GoToMeeting (same company). Unless you're trying to lose client's trust, waste their time, and lose deals, do not sign with JM! None. JM is costing us time and deals. "A great tool to have team meetings and webinars"
We really like the concept of join.me as it helps us the way we want, all our team meeting and engagement is done through join.me and also on slack. Since slack can be easily integrated onto the platform, this makes us really easy to make join.me the primary tool for our regular meetings and conversations. Also the support is really awesome as we will get our issues cleared in no time. The pricing is a bit high and needs to be considered as early as possible. Great tool to do all calls and related activities, its a great platform to manage the team on offshore ! We are having all our team meetings on join.me and we are more over satisfied with their service as the call will not hang and drops over time ! Really easy to use meeting software that also can double as remote support software. Users have to install the full app in order to allow their screen to be seen. For less technical users this can prove challenging, although from my perspective the software is very easy to install. Join.me is a great software to use for anyone who needs to conduct small online meetings (12 or less attendees). We also use it with many customers for remote support as it will allow the meeting Admin to see other's screens and take control of their computer when they choose to allow it. I would recommend giving their software a trial run to see if it works for you. They offer a free trial so it is certainly worth a look. Their paid service is solid and rarely has quality issues. Online meetings, online training and remote tech support. "Useful tool for online meetings"
Allows me to share my screen with multiple people, record your screen and share calls, integrate meetings into my Gmail calendar invites, has very good video quality. The person on the other end doesn't seem to have much of a lag, if any at all. Easy of use for the end user, well-designed webpage. Simple, quick download for quick remote connections to workstations. If you don't have too many requirements, the free version is more than enough, now for companies with many workers or who need more control over their meetings may prefer to use the paid versions. I recommend it. It's compatible with both phones and smartphones and tablets so you can use it everywhere. Easily having online meetings. You can communicate quickly with costumers. What I like best about join.me is that its simple to get started. You simply ask your customer to go to the site and have them click get started. Its also a great way to share files to and from the remote location. Its been great when we need a connection "right now"
I don't like the fact that it requires you to create an account to host a meeting when the person joining the meeting already has an account. It used to let you use it without an account the first time, which was great. I also wish there was a way to have it always running on a location, but for that we use Logmein which is who owns join.me. If you are currently using logmein, join.me is a great companion. Its a great product that works and requires very little of the computer. Its also great when you need to have more than one set of eyes looking over a problem or presentation. We use join.me to support our customers remotely, especially in one off situations where you only need to connect one time. Its been really great when we have new customers an want to install join.me's big brother, Logmein. We can have the customer start a session and then once we are logged in we can install any required software. We've also realized its a good way to share with more than one person when needed. "Join.me is very helpful for our company!" The thing that I like best about join.me is that it helps our company be able to be together, I wanted to make a company that lets people to work from home but we didn't know how until we found out about join.me; join.me helps us be able to talk to our workers as they're in there own house. A thing I dislike about join.me is that sometimes our meetings freeze or glitch and we have to restart the meeting for it to be fixed, I really hope this will be fixed soon as it's a really good application. We are solving a way to be able to let people be able to work from home, join.me allows us to be in contact with them as some of our workers live in different countries. Join.me allows me to write on my screen and images appear on my clients' screens. This means I can coach, teach, tutor, and guide individuals who don't live in my area and it is as though I am there with them. I am still learning about the different things I can do while working with a client online. The ability to change pens with ease, create shapes, draw, and highlight makes my job much easier. The ability to record the session makes it cheaper for my client because he or she knows that repeating what I explain is not as necessary as it was before. I'm looking forward to whatever improvements the join.me team will come up with next. I used to drive to every client and as a result put 46,000 miles each year on my car (nearly 1000 miles each week). This last week, I only put 100 miles on my car and earned twice what I earned the same time last year. It has changed my way of operating. "Easy to use and effective collaboration tool "
Sending a client a meeting invitation with the join.me platform is really easy. You can set up a meeting and send the invite thru the join.me website/interface or send them an email containing a quick copy/paste from the join.me interface. Once connected clients usually have no problem navigating the options/buttons. Passing the screen back and forth between team members and clients is also streamlined & easy to do. Recording meetings is also very nice. You hit the record button, then after the meeting you can retreive your recordings. Being on a team and having multiple presenters can create a challenge. For instance, if one person logs in and updates their name, profile photo, etc those changes will apply to anyone also using the platform. For instance, if someone else presents and updates their name/photo, the next time I present (on a totally different computer) my name and photo will be changed. Due to this we have multiple accounts which is clunky at times. Make it easier for multiple presents to store their name/photo. Presenting and collaborating with clients on daily meetings, routine report meetings and on large-scale projects. Join.me handles meetings of all sizes very well. Most of my meeting are virtual and Join.me allows me to effectively run my meetings. Join me is great software. Me and my team uses a lot. There are many advantages using this software which includes, easy operation, not very complex UI. Also the best one is screen sharing. We can get clear and fast screen share if proper internet connection is there. Also join me has mobile app which makes it convenient to use anywhere. It does not work properly in slow internet connection and voice fades away. They should provide feature that does not decrease quality of voice and decrease quality of video. Join me app sometimes heats my phone when used for longer period. I surely recommend join me for those who are working in a team across different countries. "Easy to use and navigate free meeting software "
Join.me offers users above average free plan option, making it a perfect online meeting tool for smaller companies and startups. It's video conferencing has great features, and the whole interface is very user friendly and clean looking. I also like that company displays their pricing on the page, so you know what you get prior to signing up. While free version is pretty generous, paid version fees are per user. We also came across multiple issues with it's desktop application. Conference calls can be difficult, but join.me offers a wide variety of features, including easy to navigate interface, screen sharing and up to 10 video feeds at a time. It is a perfect tool for small and startup businesses on budget. Or if you need last minute option for meeting scheduling. Join.me was a great option to set up last minute, small meetings and invite partners to it (even offshore). I't user friendly interface was easy to navigate for all team members. "Helpful for collaborating with remote facilities"
Cost is a little high for what we would use it for. If we had higher volume of long-distance clients, it would validate the expense. Love how user-friendly this site is! Don't need the IT team to come and give a long presentation on how to use it! Just give the code to the client and they're set to go. The best way to get input on a project from multiple sources in a quick and easy fashion. I can contact designer, owner, producer, and manager all within the same call to make sure we are on the same page as we move forward on a project. "Good platform, but has some strange bugs"
The layout is very easy to get used to. The voice and video quality seem largely dependent on the internet connection that you or the other users have available. The layout and interface are very easy to get used to and use. The video bubbles for users when a screen is being shared are too small. The user should be able to increase or decrease the size of the bubbles. One of our users was unable to share their screen. When we went to pass them the presenter role, join.me said she needed to download the join.me desktop app, but the app was already downloaded to her computer. It took deleted the entire application and reinstalling everything to get it to work. We are selling a healthcare technology product and join.me allows us to show our product via teleconference as well as communicate internally. "Screen sharing at its best"
Paid version should maybe have more than 1 user. Maybe 3 per company for example. But free version is good either way. Share up to 10 screens at the same time with join.me. Try it out for free first to see if you enjoy using or not. I am able to demonstrate to our program company's IT department what is wrong with any program in the computer before they arrive. They have managed to provide solution thanks to join.me for showing them the issues. join.me is a simple to use but feature rich cloud based application that allows for simple to more complex collaboration and meetings. Its screen share and ability to allow other users to share their screen and or take control of the mouse are great tools that allow all participants to easily be engaged. Whether you need to start a meeting right away or schedule in advance, join.me has the ability and integration through a Google extension makes it is to use your Google calendar to add a new meeting invite to your calendar and send out to participants. There are not very many things I find to be lacking with join.me. Perhaps in earlier releases but being a progressive customer focused company they have added features and improved the product in many ways over time. If I had to express one thing that I felt could be better it would simply be the ability to allow more video users in the pro version which currently allows 10 and can some times be restrictive for larger teams where users are spread out remotely. Give it a try, you won't regret it. Connecting people from various locations and allowing users to demonstrate progress, problems, plans and solutions. Its like having your entire team in one room. Without it we would not be able to be as diverse and geographically dispersed. "Good Connections - Really Simple to Use"
It does exactly what it needs to. Connects me to my prospects for a visual presentation / demonstration. Allows me to customize a link and send to prospects to simplify the connection come meeting time. Sometimes there are connection issues - it's pretty rare, but it always seems to happen when I need it most - of course. Occassionally it will glitch out my computer as well - just basically takes too much CPU and creates a freeze that I will have to wait to force quit the app. It's pretty reliable - occasional connection issues, but usually fixed pretty quickly. Doesn't have any frequent or ongoing problems / frustrations. Demonstrations and presentations. We don't use it for audio - that all goes through our VOIP system. But for visuals it's exacty what we need. "The simple but very powerful conference service"
The main advantage of this service is its simplicity. The application itself is easy to use. In addition, most importantly, creating a meeting is very simple. You only need to create a meeting, give it a name, a couple of notes and you can send an invitation to friends and colleagues. There is also integration with your Google calendar and with Outlook. A couple of times I did not have a connection. I also do not like that there is no way to integrate join.me into my blog or website. It would be very convenient to have such an opportunity. I also do not like when I want to start a conference, the program can suddenly start to be updated. It is better that this would happen after the program is closed, and not during its launch. You definitely should try. This service has a flexible payment system. Just basic functions will be enough for most users. We started our acquaintance with the free version and understood how convenient this service is. So now, we use a paid subscription to our entire team. We cover all our requirements for cooperation with our customers. "Very good, easy to use webex tool"
I like that it is straightforward. You get a link and you share it to whomever you need to - and that's it. Link is self-generated. No tech skills needed. Nothing really. As I mentioned before, it's very easy to use. Anyone in a professional setting can handle this. I would highly recommend this program to anyone. When I need to do a quick webex environment with a client - this is a very QUICK and easy tool to handle this. We don't get a lot of time with clients on the phone, so when we have their attention - it's important to be able to show them something of value in a short amount of time. This does that. Esta herramienta Join.me es una plataforma que busca facilitar tanto a los usuarios como a las empresas la posibilidad de crear videoconferencias o reuniones con la posibilidad de que uno de los participantes sea el administrador de la sala y pueda mostrar tanto una ventana de su sistema como una presentación en diapositivas o la pantalla completa a la vez que se comunica con los participantes a través de VoIP. Entre los beneficios que brinda es que es compatible tanto con ordenadores como con smartphones y tablets. Posee audio ilimitado para todos los usuarios a través de VoIP tanto desde PC como desde dispositivos móviles y lo que mas me agrada es que permite grabar las conferencias, las cuales se almacenarán de forma segura en la nube de LogMeIn. I use join.me to help my clients so that clients and I are looking at the same thing at the same time. This especially helps when I have inexperienced clients or are not as computer saavy. So far so good, everything I have needed so far, I have not ran into any problems so far! Each time I have screen shared with a client we were able to share the information we each needed. If you need to know the exact thing a client is seeing for you to help them, this is perfect! Faster solutions so clients don't have to repeat themselves. Also, I don't have to keeping telling or asking a client if they are at the right point on a particular page! As an IT manager, I use join.me almost daily to connect remotely to workstations. In many cases, it is really helpful to see what the enduser is seeing. Once the application is downloaded, it's easy to direct them to join my meeting and take control of their computer. When performing administrative functions on an end-users shared screen, the Windows dialog boxes do not appear. While it is relatively easy to have an participant go to a web link to join the meeting, most of the functionality requires the application. I find that it is much easier to tell the person to download the app first. I also find it annoying when the app forces the end user to register for an account. When you are assisting people, this adds time. I remotely support multiple people. Join.me has made this process easier. The price and the features are great. We went from a company where we paid a rate/minute for every call and it was crazy how large our bills were. With Join.Me we reduced our bill to a monthly rate (except for international toll free calls) and gained more features. The online screen sharing is a great addition. Sometimes there is echoing when using a large conference room without many people--we don't want to use headsets for each individual on the call in-house so we deal with this small issue. The online site allows for overlap of calls with one license. We had to set up an internal "room" with outlook to ensure that there aren't overlaps in calls. This is the only thing that I think could be improved, but for now, ensuring that you find a way to avoid this, the software is great. We've saved money as well as increased the features available. It's great to share screens and show presentations to numerous clients without requiring travel. Software makes me better at working resources. I can make our build link to whatever we need. Setting up our individual link means that folks connecting to your meeting get information about you and your brand before they have even entered the meeting. As for me, it is a very useful platform. With screen sharing and our connection in real time I never had problems. I hope it is will be more develop and will bring more options. Definitily good platform for sharing and make effective meetings. For sure all your work will be much better and faster. All working process and install are really very easy to use. The simple way to log in and control online meetings, whether members use their own phone or their computer's audio for communication. Also, we have the opportunity to share our screen works better and introduce a too big group of people has become simple even remotely. "Basic screen sharing well done"
Recipients can runs from the browser without requiring an installation. Solid and reliable. Quality good. Friction free UX. I like being able to see the other participants in a small video circle. Easy to pass control to other presenters and also to pass mouse control. I'd love to be able to trigger video streams that run DIRECTLY on other computers, not via capture of my screen. The parent company, LogMeIn, is very strong and technically capable, even if I dislike their GoToMeeting product. Our software developers/engineers use JoinMe for pair programming. We use it for customer onboading and support. In one year in a new AAAA office space, we have had zero client visits because JoinMe meetings have been so satisfactory. "A good service when you need a backup for your main service"
The ease of it when it works. I have always used it whenever my main service (Zoom / Skype) has issues. But that does not mean that this has issues. It has worked only in that means for me. The speed. The app size and the ease. Updating (100%) and it just hangs. Everytime you open join.me app, it updates - in windows. I am not sure what is getting updated. Every single time. I am not happy about it at all. Use it fresh when you do not have any further options. If you are using the existing product, it will keep updating. I am not sure why. My attachment would help you understand the reality. Basically, when I have asked people to use join.me, I was able to accomplish 50% of the time - what I desired. I do not have to tell the users what to do. They understand the app and install it and get ready in minutes. However, there is another side to it. Sometimes, if they face issues, then it is done. We will not progress. As I mentioned, this gets used as a backup service in both the organizations that I work. The benefits are - When it works, I can ask the users to install and get up to speed in minutes. There is no need for any explanation. Open - Install - type number - boom, you see the screen. "Simply conduct online meetings with shared access to the screen." I really like that I can unite people from different places and conduct reviews and demonstrations of projects. Moreover, I have the opportunity to record my sessions for future use. Video recording is very easy to create, and the quality of sound and video is very good. Simplicity in the use of basic functions makes it possible to use the service for any audience. A user-friendly interface, even for people who do not understand technology. Sometimes there are problems with sound, especially if many people have remotely joined. Not exactly a convenient update function, namely that you need to remove and reinstall. I do not want to waste time on this. Great for any calls or meetings with customers. Extremely easy to use. It is very simple to attach a participant - by a link or with an access code. There is an opportunity to record your online meetings for those, for example, who missed. I used both free and paid versions, and so, I believe that both have advantages. For example, with a paid version, you get the join.me domain, which allows users to easily log into the system. I tried to use other resources to hold online meetings and share the screen, but they are very slow. joinme works quickly. Therefore, I can confidently recommend this software to you! In our company, we constantly use Join.me to showcase presentations to our partners or customers, this allows us to demonstrate those moments that are difficult to explain by phone. join.me quickly and easily allows the client to join our online meeting on the link that we save at each meeting. Sometimes we use this service to conduct internal meetings or trainings. Light weighted and very easy to download and install on your system. Works in even slightly low connectivity as well. Option to join meeting with a custom url makes it easy to connect to anyone outside the company as well. Participant control commands are very handy to use. Recording of audio and video is of very good quality with join.me. No issues except some occasional connectivity issues but that is just momentarily . This is a cool product and found it always working as per the expectation. Nice product with all necessary features for audio and video features. I used it both for business meeting and personal meetings and this is really a cool product. Meeting across the team and conferencing across the different geographic location has been seemless abd very efficient. Excellent audio and video quality and supports conferencing over IP with optimum bandwidth utilisation. 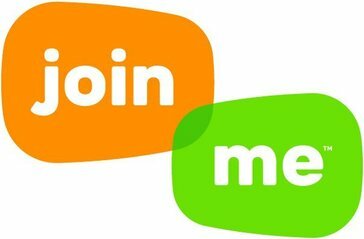 Join.me offers a custom meeting url to send to any person outside company to join meeting on the web. Easy to join call on mobile device. Offers various featured to control the participants action like muting someone, adding someone and removing a participant from the meeting. This is although rare now but still it needs to fix issue with disconnection without any internet connectivity. Great communication product and you become habitual of using join.me after few uses. I have been using it instantly for quick discussion with in out team. This has helped a lot in communication and increasing team productivity due to its quick utilisation. I like that join.me is easy to use on both my side as well as the side of the person invited to the meeting. It's basic and gets the job done. I've had malfunctions with the camera being on and at the time I wasn't aware. The user interface could be a little more user friendly. I would highly recommend join.me for those who are hosting small webinars or one on one meetings. It's easy as sending and clicking on a link! We are able to conduct one on one meetings with our sales reps and these meetings allow us to be interactive as well as productive in a sense of on-boarding in a more thorough manner. 1. Everyone who I send an invitation to join the meeting can easily do this; they do not need to register and do a lot of unnecessary work. 2. Customize any background of the meeting. This function is not very important, but it helps to set everyone up for an enjoyable video meeting. 3. The important thing is that it is easy and quick to create a meeting. 4. There is a mobile application that will allow at any time to be in touch. 5. Sharing the screen let me hold quality and high-level meetings. The software is quality and I had no problems at the time of using join.me. I would like the sound of the ringing to be louder. If you want to use join.me, but do not know if it will suit you or not, then you have a great opportunity to try the free version. In addition, you need to organize just a few free video meetings and you can be sure that this service it just perfect. join.me is software that helps me and my team to contact clients, hold meetings, seminars, conferences. join.me helps to save time since I can invite to a meeting, a large number of people from different parts of the world and make one seminar for everyone. In addition, I can send a recorded of the seminar for everyone who could not join in time, it's very convenient. * We monitor all join.me reviews to prevent fraudulent reviews and keep review quality high. We do not post reviews by company employees or direct competitors. Validated reviews require the user to submit a screenshot of the product containing their user ID, in order to verify a user is an actual user of the product. Hi there! Are you looking to implement a solution like join.me?